This spring, Apple is going to release a new update for its iOS Devices. With release of iOS 11 Apple having changed so many things, the 11.3 update will see some more cool enhancements added to the UI. Although the official beta for this update is yet to be released, let’s take a sneak peek into what to expect! In love with the Animoji on your iPhone X? There is some awesome news for you! 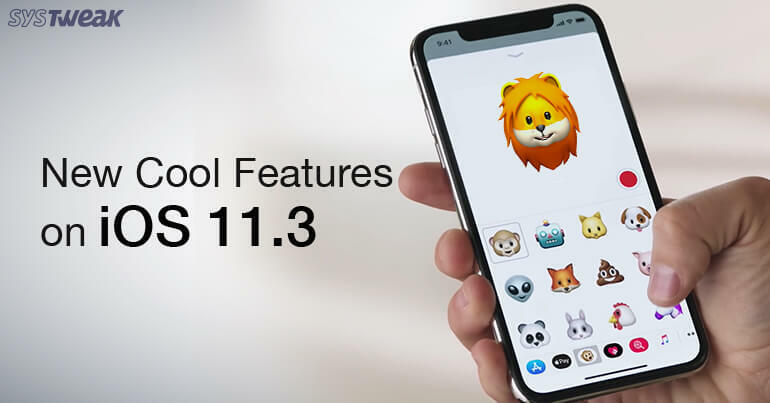 The latest version will get 4 new Animojis, which are a dragon, a skull, a lion and a bear. Now you can amaze your family and friends with these new Animojis and like before you can use any of them to make Animoji karoke. Apple has been into controversies because of issues in battery in its older devices. On iOS 11.3 you will be able to check battery health and recommendations if your battery needs to be serviced. This can be found in Settings>Battery. Feature will be included for iPhone and later. In addition to this, you will see the power management feature which will manage performance to prevent your device from an unexpected shutdown. The health app which was known for tracking fitness activities and for keeping basic medical information about you, can now help you to keep fit and find your health record data. This data will be encrypted so you can feel secure about the confidentiality of your health records. You will be able to pick from the list of given hospitals or clinic which will be on board to find your health records. With this new update Augmented reality is going be never before on iOS devices because now apple is coming up with ARKit 1.5. In addition to horizontal surfaces like chairs and tables, it will now recognize and place virtual objects on vertical surfaces such as doors and walls not only this, it will now be more accurate in mapping irregularly shaped surfaces like circular tables. Apple says this Airkit will interact will real world objects to bring a movie poster to life or to fill a museum with interactive exhibits. Well this is really going to be a revolution in the world of Augmented Reality. Why to go to the website to contact customer support or why call when you can ping them just from the messaging app on your iPhone. Yes your messaging app will now have a feature to chat with a business and to pay using Apple pay for your purchases. Business chat will not share users contact information with the business and users will be able to stop the chat at any point. So this spring get ready to add new life to your iOS 11 device with these cool features. Apart from this you may also expect to have airplay 2 which will allow to play different music on different speakers attached to it. Keep waiting for the next update it may have some more exciting features. Next Read: How To Enable “Type to Siri” In iOS 11?